What Are the Dangers of Eating Spoiled Crab Legs? Can You Eat Oysters When You Are Pregnant? Can You Eat Shellfish While Breastfeeding? While you are pregnant, proper nutrition is necessary for your baby to develop properly; however, the safety of the foods you consume can also impact your baby’s development. Due to hormonal changes, pregnant women have a higher risk o contracting food-borne illnesses, making it vital for them to monitor the types of foods they consume for reasons beyond just their nutritional value. Avoid eating any raw or undercooked meats, such as beef and poultry, while pregnant, including raw poultry that has been pre-stuffed. These meats carry the risk of being contaminated with salmonella, coliform bacteria and toxoplasmosis. Your infant can be infected with toxoplasmosis while you are pregnant, which could potentially lead to blindness or brain damage. To prevent this, cook your meats thoroughly. Do not rely solely on the meat’s appearance – always check the internal temperature with a meat thermometer. Pregnant women are 20 times more likely to contract listeria, a bacteria that may cross the placenta and lead to miscarriage; premature delivery; stillbirth or neonatal death; and infection or blood poisoning of the fetus. These bacteria can contaminate these types of deli meats and thus should be eaten with caution if you are pregnant. If you decide to eat deli meats, reheat the meats to the point where they are steaming or reach 165 degrees Fahrenheit. Refrigerated and unpasteurized pate and meat spreads may also contain the bacteria listeria, and should be avoided during your pregnancy. 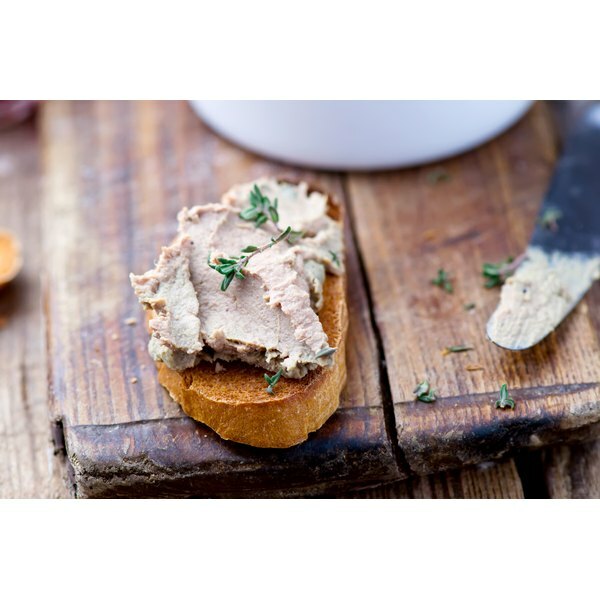 If you want to eat pate while pregnant, canned pate or pates that are shelf-safe are safe to eat. You should also avoid eating large amounts of liver during your pregnancy. Liver is high in vitamin A, and high levels of vitamin A have been found to lead to birth defects. Raw and undercooked fish may contain bacteria and parasites, and should be avoided during your pregnancy. Fish that contain high levels of mercury should be completely avoided during pregnancy, including marlin, swordfish, shark, king mackerel and tuna. Smoked seafood – the kinds found in the deli section – may contain listeria, and should be avoided unless cooked thoroughly. Exercise caution when eating locally caught fish such as bluefish, pike and trout, as these fish may be exposed to industrial pollutants. Contact the Environmental Protection Agency to determine if fish from your area are safe to eat, suggests the American Pregnancy Association. Laura Wright started writing professionally in 2010. She has worked with women's health issues and gender-based violence, and as a research associate on human rights with The Protection Project. She earned both a Bachelor of Arts in sociology and anthropology and a Master of Public Health from West Virginia University. Which Foods Contain Retinoic Acid? Why Shouldn't You Refreeze Meat?